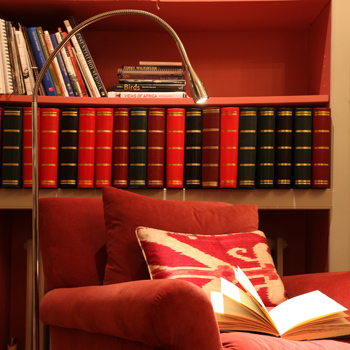 There are few better places to read a good book than on a comfy sofa. However, in many homes, poor lighting presents a major obstacle. Table lamps tend not to be the right height, standard lamps are usually in the wrong place and most wall lights are simply too feeble. To solve this problem, we have created an elegant flexible floor standing lamp called the “Pocket of Light”. It provides the perfect neat solution that can sit almost invisibly where you want to read. This energy efficient 4w LED fitting reproduces the quality of light of tungsten halogen and is an ideal task light. It can easily be adjusted to exactly the right position and, with its low-glare black baffle, it provides a well-directed beam of light which won’t dazzle the person sitting next to you. The warm white light and excellent colour rendition it produces also makes it ideal for lighting a work of art. The ‘Pocket of Light’, which is designed in-house and manufactured in the UK, even has an integral dimmer with a memory function which ‘remembers’ the light level at which it was last used. The Pocket of Light is available in bronze, nickel and satin nickel to suit your interiors. For prices and to order, call Sales on 020 7371 9000 or for full product details, click here.